Diversified blue chip John Keells Holdings Plc (JKH) has suffered a 13% dip in pre-tax profit in the third quarter of the current financial year, dragging the first month’s figure down by 4%. As per the interim results released yesterday, JKH’s consolidated pre-tax profit for the third quarter declined by 13% to Rs. 5.8 billion whilst the post-tax profit was Rs. 4.8 billion, down by 15% from a year earlier and net profit attributable to equity holders of the parent declined by a similar percentage to Rs. 4.49 billion. Group revenue in the third quarter however was up 12% to Rs. 31.2 billion. Cost of sales has increased by 23% to Rs. 24.3 billion resulting in gross profit declining by 15% to Rs. 6.8 billion. Results from operating activities were down by 32% to Rs. 2.4 billion. Finance income was down 1% to Rs. 2.6 billion. The cumulative revenue for the first nine months of the financial year 2017/18 at Rs. 87.66 billion is an increase of 15%. The Group pre-tax profit was down 4% to Rs. 14.87 billion. After-tax profit was down 5% to Rs. 11.8 billion. The profit attributable to shareholders in the first nine months at Rs. 11 billion was down by 2% from a year earlier. 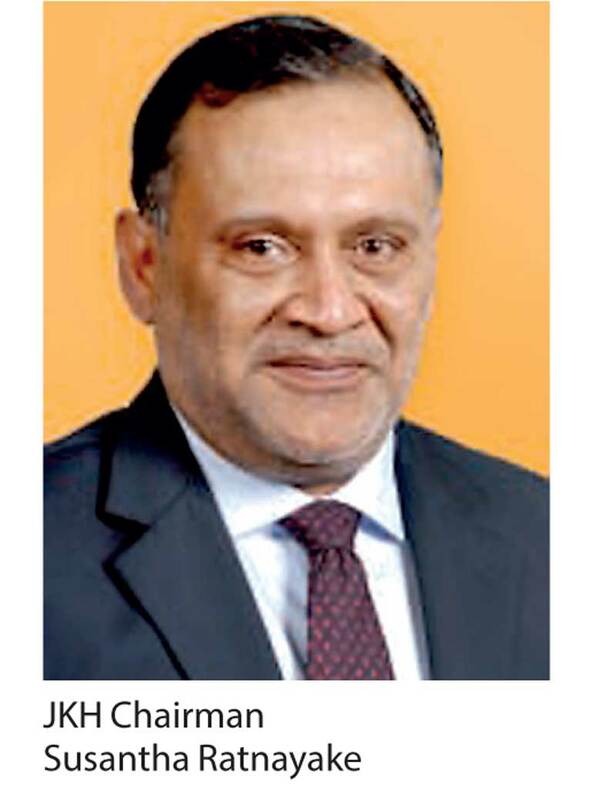 See page 2 for a review of the performance of segments of JKH by Chairman Susantha Ratnayake. The Transportation industry group PBT of Rs. 945 million in the third quarter of 2017/18 is an increase of 12% over the third quarter of the previous financial year (2016/17 Q3: Rs. 845 million). During the calendar year 2017, the Port of Colombo witnessed a year-on-year growth of 8% whilst South Asia Gateway Terminals (SAGT) recorded a growth in throughput of 11%. The market share and profits of the Group’s bunkering business increased as a result of a double-digit growth in volumes. The performance of the logistics business was in line with expectations. A new 57,000 sq. ft. warehouse was commissioned in Enderamulla during the quarter under review. DHL Keells recorded an improvement in performance driven by growth in its active customer base. The Leisure industry group PBT of Rs. 901 million in the third quarter of 2017/18 is a decrease of 34% over the third quarter of the previous financial year (2016/17 Q3: Rs. 1.36 billion). The decline in profitability is mainly attributable to the City Hotel sector which witnessed a decline in occupancies primarily as a result of the increase in room inventory within Colombo. However, it is encouraging that the total number of rooms occupied in the city witnessed double-digit growth in the quarter under review. Whilst the Sri Lankan Resorts segment recorded an improvement in room rates and maintained occupancies, profit for the quarter under review was lower when compared to the corresponding period of the previous financial year which included the operations of Bentota Beach by Cinnamon which is now closed for the construction of a new hotel. The Maldivian Resorts segment recorded an improvement in average room rates, although profitability was impacted by lower occupancies and the partial closure of Ellaidhoo Maldives by Cinnamon for refurbishments in October 2017. However, occupancies at our hotels remained above the industry average during the quarter under review. The Property industry group PBT of Rs. 34 million in the third quarter of 2017/18 is a decrease of 83% over the third quarter of the previous financial year (2016/17 Q3: Rs. 196 million). The decline in profitability is on account of the third quarter of the previous year which included recognition of revenue on the ‘7th Sense’ on Gregory’s Road residential development. The construction of Cinnamon Life is progressing well with the super structure approximately 50% complete. Parallel to the ongoing construction work of the super structure, the installation of the façade of the hotel will commence shortly. The construction work on the main access point via a six-lane bridge is nearing completion. The pre-sales of both the residential and commercial space continues to be encouraging. The design concept for the new 800-apartment joint venture residential development project ‘Tri-Zen’ in Union Place, Colombo has been finalised whilst the schematic designs are currently underway. This unique development will target a broader section of the market with apartments offered at attractive price points. Pre-sales have commenced and initial bookings are very encouraging. The Consumer Foods and Retail industry group PBT of Rs. 947million in the third quarter of 2017/18 is a decrease of 26% over the third quarter of the previous financial year (2016/17 Q3: Rs. 1.29 billion). The decline in profitability is on account of the Consumer Foods sector and to a lesser extent the Retail sector. The Beverage and Frozen Confectionery businesses recorded a decline in volumes as a result of continued tapering of demand arising from subdued consumer discretionary spending. The volume decline in the beverage business was further exacerbated by the implementation of a sugar tax from November 2017, which resulted in substantial price increases across the industry. Whilst over the years the company has taken measures to reduce a significant quantum of sugar in its beverages, it will continue to aggressively expand its low sugar product range by accelerating the launch of such new products. As a continuing part of its beverage portfolio strategy, it will also launch more non-carbonated beverages to broaden our offerings. Keells Food Products Plc recorded an increase in profitability on account of a better sales mix. The Retail sector recorded growth in footfall contributing towards a year-on-year growth in same store sales, although profitability was impacted by store expansion related costs and promotional expenses. During the quarter under review, three new outlets were opened, bringing the total store count to 72 as at 31 December 2017. The stores opened during the quarter featured the new branding which will be rolled out to the existing stores as well in the ensuing quarters. The branding initiative encompasses new elements to the store in line with evolving consumer needs which the company is confident will drive footfall, although this impacted the rollout of the store openings for the quarter under review. The Financial Services industry group PBT of Rs. 1.54 billion in the third quarter of 2017/18 is an increase of 35% over the third quarter of the previous financial year (2016/17 Q3: Rs. 1.14 billion). The increase in profitability is on account of the performance of Union Assurance Plc, where gross written premiums recorded strong growth above industry average whilst Nations Trust Bank recorded sound loan growth during the quarter under review. The Information Technology industry group PBT of Rs. 86 million in the third quarter of 2017/18 is a decrease of 56% over the third quarter of the previous financial year (2016/17Q3: Rs. 195 million). The corresponding quarter of the previous year included profits of the Group’s BPO business which was divested in September 2017. The Office Automation businesses recorded a decline in profitability on account of lower volumes in its product segments. Other, comprising the Holding Company and other investments, and the Plantation Services sector, recorded a PBT of Rs. 1.37 billion in the third quarter of 2017/18, which is a decrease of 19% over the third quarter of the previous financial year (2016/17 Q3: Rs.1.70 billion). The decrease in PBT is mainly attributable to lower exchange gains recorded at the company on its foreign currency denominated cash holdings compared to the corresponding quarter of the previous financial year. The performance of the Plantation Services sector was impacted by trading losses due to a decline in tea prices within the quarter under review.